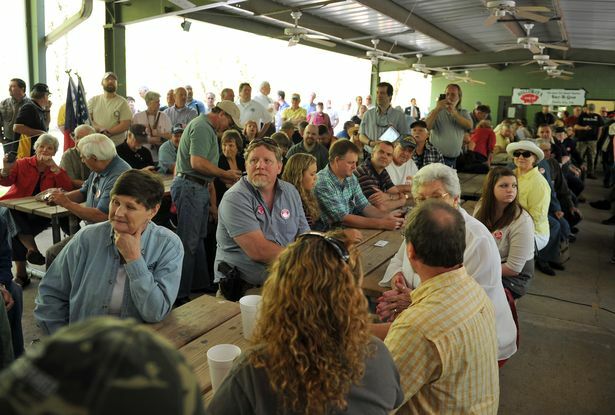 There were perhaps two hundred supporters at the outdoor pavilion along the Coosawattee River in Ellijay to watch. I didn’t see a single person of color. There were guns everywhere. 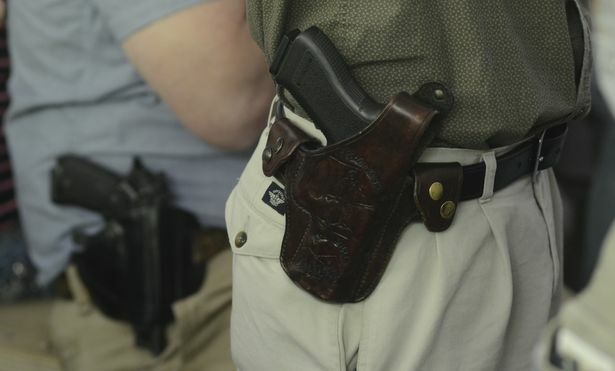 The holstered handgun was the accessory of choice among supporters. One supporter held a full-sized old school Georgia flag with the confederate battle emblem. It probably got in every TV story. House Speaker David Ralston’s statement to the roaring crowd that “it is a community where we cling to religion and guns” was the rhetorical highlight. When Rep. John Meadows (R-Calhoun) gave a welcoming statement saying he’d “even welcome the news media. (Pause) I’m not sure why,” it was tempting to answer out loud “because you love the first amendment as much as you love the second amendment.” But that would have just started an argument. Gov. Deal seemed stumped when I asked him three times, in various ways, why guns continue to be banished from the state capitol. Deal is usually pretty nimble on his feet, but he never answered the question. My story on WXIA featured the exchange. The issue about guns in the capitol was a rare opportunity to ask a challenging question that expressed viewpoints by those for and against broader gun rights. I suspect it will be asked again in the fall debates. Presumably, Gov. Deal (and Sen. Jason Carter, who supported the measure) will have formulated a coherent answer by then. On the other hand, Greg Bluestein of the AJC and Jonathan Shapiro of WABE radio asked questions that were more relevant to issues raised by the new law. It’s always fun to see a WABE reporter gathering news outside the perimeter. As he walked to his car, I asked Deal if he was “afraid” to have guns in the capitol. He didn’t answer, and we chose to edit out that question because it sounded disrespectful. That night, the AJC reported that Carter also dodged a reporter trying to question him about the gun law. Our video of Gov. Deal walking to his car prominently featured the shoulder of Chris Riley, Deal’s chief of staff. 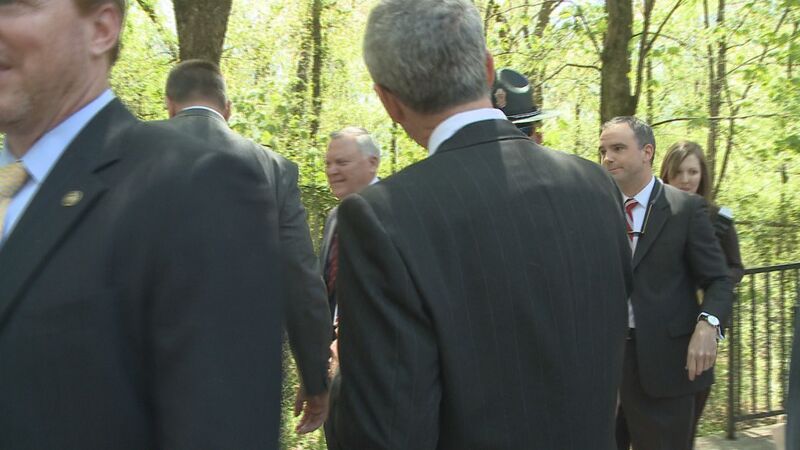 When Riley saw us by the Governor’s black SUV, he positioned himself in front of the camera lens, and leaned into the lens as WXIA photog Luke Carter tried to move to get a clear shot. It was the discreet version of the hand-in-the-lens shot. Riley apologized to Carter afterward. Well played, Riley. This entry was posted in AJC, WABE, WXIA on April 28, 2014 by live apt fire. My favorite suit right now is one I purchased for $150 on eBay. Its label says “Kenneth Cole / Reaction.” It was listed as $300 retail. It’s the proverbial cheap suit. Yet the wife actually went “ooh!” last time I put it on, and without irony. The label says it’s composed of 85 percent polyester and 15 percent rayon. It has proven water resistant qualities. Presumably, it’s durable and fireproof. And it looks OK on my lumpy frame. I know many adult male professionals who never wear suits. But lawyers, politicians and TV reporters are saddled with the burden of purchasing and wearing suits. Lawyers and TV anchors can be frequently seen in thousand dollar-plus tailored suits. The rest of us with more modest paychecks have to dress accordingly. I know plenty of TV reporters who sing the praises of their cheap suits. Their go-to typically is K&G Men’s Warehouse. It’s also the go-to for police detectives, a profession whose couture and salaries are more mismatched than most. My go-to is eBay, first suggested by my sister who is a public defender. I’ve bought at least five suits off eBay. All of them were new (verified by the fact that the pants were unhemmed). 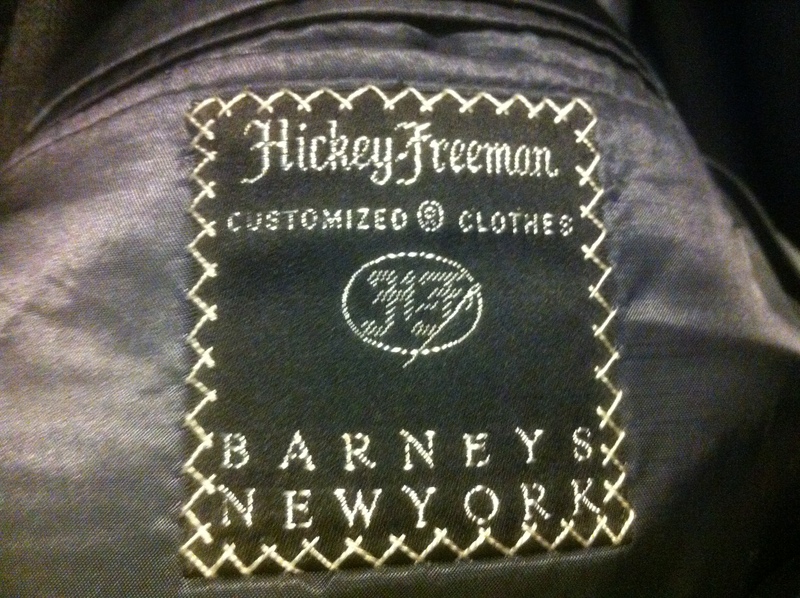 Three of them were Hickey-Freeman brand, and had tags sewn in that indicated retail prices that were substantially higher than the two to three hundred dollars I paid for them. They are my “expensive” suits. 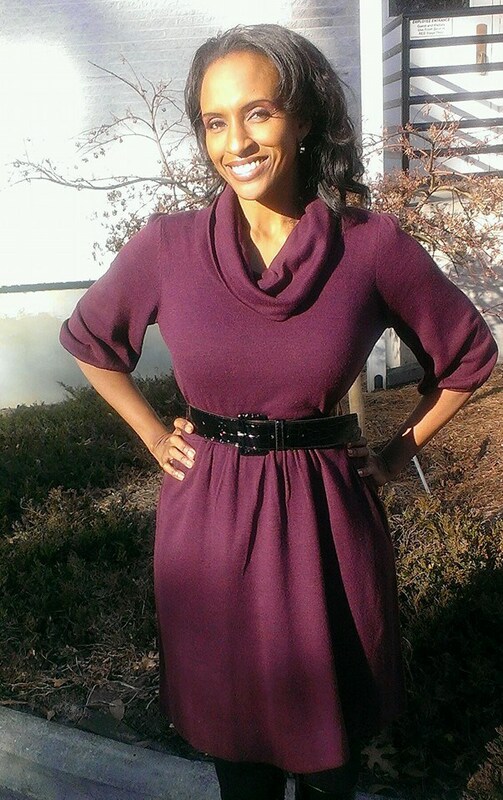 Portia Bruner: Clearance rack dress, thrift store belt. But lately I’m more sold on the cheap suits, and I’m not alone. My friend Portia Bruner has created a thread on Facebook that shows her (looking great) in garments she has purchased at thrift stores. Portia is a reporter and substitute anchor at WAGA, and a mom with two adorable boys in private school. In other words, she is understandably budget-minded. My coworker Valerie Hoff is a walking bargain-bin promotion, as detailed on her Ways to Save site and in random anecdotes I frequently overhear from her desk. The WXIA anchor/reporter views bargain hunting as a sport. Like Portia, she wears the cheap stuff with style. 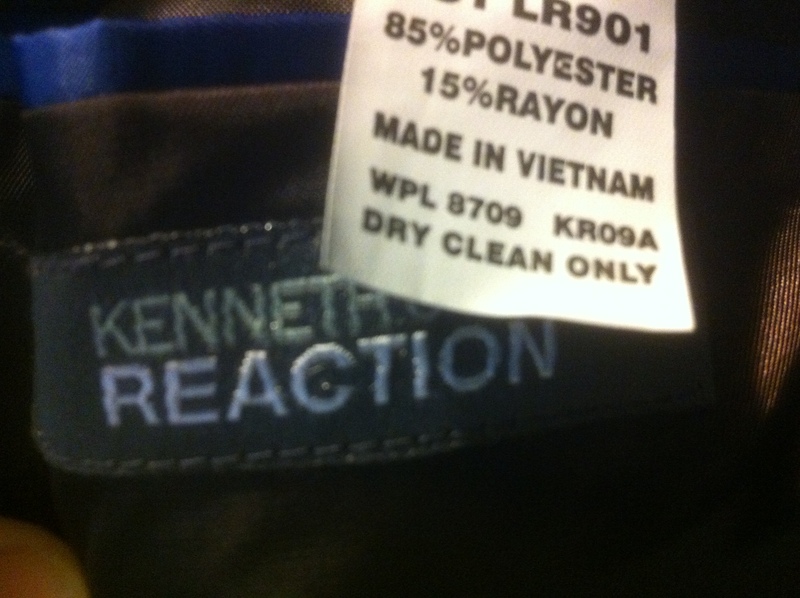 I purchased the “Kenneth Cole / Reaction” suit by accident. I needed a suit for a costume. The suit that arrived in the mail had a subtle color that surprised me. When I put it on, I was horrified that it not only lacked the costumey quality I’d expected, but also looked better than some of my pricier suits. This points to one of the pitfalls of ordering a suit from eBay: You may get surprised. But it may be a pleasant surprise. This entry was posted in WAGA, WXIA on April 15, 2014 by live apt fire.